Cotoneaster (Cotoneaster spp. ): growing, planting, caring. 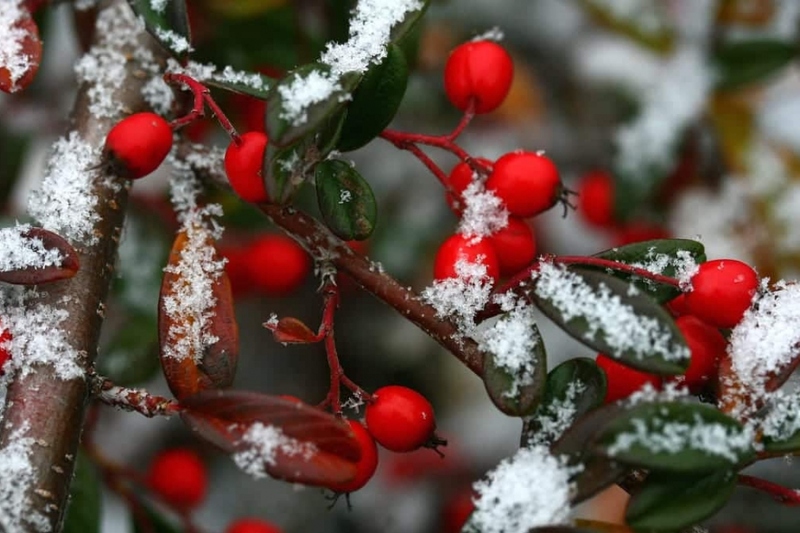 A hardy shrub with bright-red fruits - for a colourful winter garden! Scientific name : Cotoneaster spp. Cotoneaster is a genus of flowering plants in the rose family, Rosaceae, native to temperate Asia and Europe, and very popular garden subjects, grown for their attractive habit and decorative fruits. Most species are shrubs growing 0.5–5 m (1.6–16.4 ft) tall, varying from ground-hugging plants to erect shrubs, with dimorphic shoots, long shoots producing structural branch growth, and shorter shoots bearing the flowers. The leaves are arranged alternately, 0.5–15 cm (0.20–5.91 in) long, ovate to lanceolate in shape and the flowers are produced in late spring through early summer, solitary or in corymbs, from white through creamy white to light pink to dark pink to almost red. Many cultivars are on the market, with the very popular Cotoneaster × watereri Exell, 'Rothschildianus' with cream coloured fruits, or C. × watereri 'John Waterer'with masses of scarlet berries. Some species have escaped from cultivation and become invasive weeds where climatic conditions are suitable for them. Small leaves alternate, often persistent, oval, shiny dark green, single flowers with 5 petals, small and very numerous, most often white, sometimes pink, very honey-loving, which produce from the end of August many small red berries or decorative orange and very popular with birds. The genus Cotoneaster has about 200 species belonging to the Rosaceae family. Shrubs, shrubs or small trees, they offer a dense and spreading habit, erected with drooping, bushy or even creeping branches. The cotoneaster accepts most soils! Exposed to the sun it will grow more berries. Dig a hole twice as big as the root ball, soak "basinate"! - the mound before planting. Plant in a mixture of potting soil and garden soil. Choose the spot depending on the variety, because the size can be imposing with some! Some medium size varieties are well suited to grow in pots or planters - in this case provide a fairly draining substrate: cotoneaster hates stagnant moisture. Cotoneaster needs water in summer, when the soil is dry. If you grow it in a pot, or in case of intense drought, you will need to bring some water, especially the first season! In winter, on the other hand, it hates moisture. You can if necessary prune the cotoneaster to balance the shrub to your liking: it does not suffer from pruning and can even be cut severely if necessary. Prune the evergreen varieties in the spring, especially the low hedgerows. Prune deciduous varieties during their rest, in winter after leaf fall. You can cut down the longest branches of hedgerows to cause new buds emergence on the trunk if it is balding. Cut in the fall for evergreen varieties - at pruning time - and in the spring for those with deciduous leaves. Take a dozen ends of branches, with a small portion of stem carrying the branch at the base. Cut of the bark, all along the length of the crossette. If you have cuttings hormone, you can soak the stalk. Remove the lower leaves of each cuttings on about ten centimeters, and plant them in a mixture of potting soil and sand. Finally place them in nursery under shelter until spring. You will then transplant each branch into a container for a final planting the following fall. Repot each year for young people, every 2 to 3 years for the oldest, in the spring, when the first grow starts to come out. Avoid pruning the roots. The cotoneaster is rather hardy and even water-consuming - however, mulching, especially the first two summers, can save you some watering! Use what you have at hand, dried leftover from mowing ... Will do very well!